The galaxy cluster Abell S1063, as seen by the NASA/ESA Hubble Space Telescope during the Frontier Fields program. The huge mass of the cluster — containing both "normal" matter and dark matter — acts as a cosmic magnifying glass, deforming the views of objects behind it. Astronomers have used this "gravitational lensing" effect to calculate the distribution of dark matter in galaxy clusters. Another way of doing this is to study the intracluster light (visible in blue), which follows the distribution of dark matter. There's a new way to map the distribution of mysterious dark matter. Stars that have been torn from their natal galaxies and now float within huge galaxy clusters can serve as dark-matter probes, a new study suggests. Dark matter is about six times more abundant throughout the universe than the "normal stuff" that makes up you and me, rocks, trees, planets, and stars. But dark matter remains difficult to study, because, as its name suggests, the substance does not emit light of any kind. Scientists can confirm its presence only indirectly, generally via gravitational effects on normal matter. For example, astronomers map dark-matter distribution in massive galaxy clusters by studying how the clusters distort the light of objects behind them, a phenomenon known as gravitational lensing. But such work is complex and time-consuming, said Montes and co-author Ignacio Trujillo, of the Instituto de Astrofísica de Canarias in Spain. 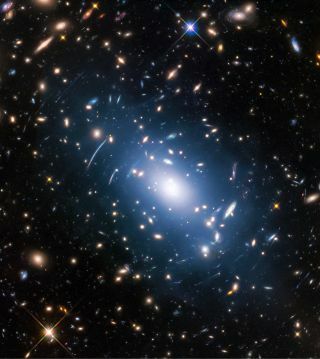 The researchers think the stars beaming out the intracluster light provide a better method, coming to this conclusion after analyzing Hubble Space Telescope imagery of six different galaxy clusters. "These stars have an identical distribution to the dark matter, as far as our current technology allows us to study," Montes said. This image from the NASA/ESA Hubble Space Telescope shows intracluster light (visible in blue) in galaxy cluster MACS J0416. The relative ease with which intracluster light can be studied — all you need is deep-field imagery — means that researchers could extend the data set far beyond six galaxy clusters in the relatively near future, Montes and Trujillo said. Such work could be done by Hubble as well as future instruments, including NASA's $8.8 billion James Webb Space Telescope, which is scheduled to launch in March 2021, the researchers added. "There are exciting possibilities that we should be able to probe in the upcoming years by studying hundreds of galaxy clusters," Trujillo said in the same statement. The new study was published online Oct. 23 in the journal Monthly Notices of the Royal Astronomical Society. Mike Wall's book about the search for alien life, "Out There" (Grand Central Publishing, 2018; illustrated by Karl Tate), is out now. Follow him on Twitter @michaeldwall. Follow us @Spacedotcom or Facebook. Originally published on Space.com.